Time for something lighter! If you have a pet with any sustained illness, you’re likely going to have to give them a pill. And with heart disease, this may mean several pills. This post describes a trick I discovered by accident that makes it much better for both you and your pet. Giving a pill to a cat can be an arduous task and source of comedy. But, with heart disease, it’s also very serious business. I’m fortunate that Rudy was a very good-natured cat as he was always tolerant (as far as cats go) for taking his medicine. The pharmacy that our vets recommended for Rudy’s medication has a hilarious– but serious– video that describes the basics of cat medication. I’d definitely recommend it for basic information– as it will teach you the basics and may even help you avoid the need for a pill altogether. I would also strongly recommend Tanya’s CKD site for information about the need for a water chaser and the potential for esophageal injury from giving any pet dry pills. After all, I think my throat would feel pretty awful if I had to swallow a gigantic pill without any liquids. As I thought about how I take pills, however, I realized that it’s even better if I could take my pills with water instead of simply water as a chaser. But giving liquids (such as a separate chaser) to a cat could be even more challenging than giving a pill. There had to be an easier way! As I looked at my options for pill syringes, I gravitated towards the Kruuse Buster Pill Syringe, mostly because of its convenient shape. But it also has a rubber gasket and a widened section that looked like it could accommodate holding water. Searching the internet revealed nothing other than a casual mention that they “could be used with water.” But how? Here are the step-by-step instructions for how I did it with Rudy. First, you want to fill the syringe under the faucet with cool clean water. You’ll get an air bubble at the bottom so you may have to tap the syringe and purge the air out. 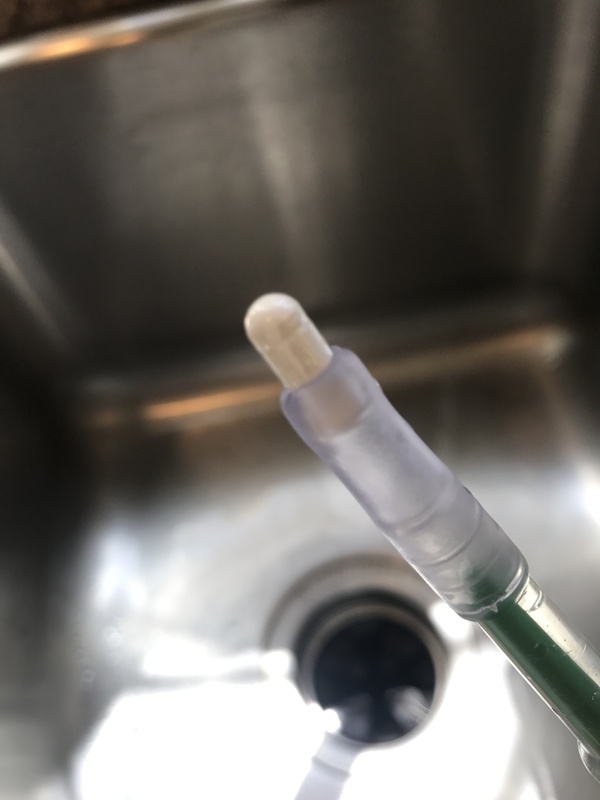 But don’t fill the syringe completely– you want the to keep a “dry spot” (or, more accurately, a portion of the tip of the syringe that will dry out eventually) near the top. The reason is that a pill or capsule may tend to dissolve a bit too quickly if you “load” your pills too far in advance if you don’t have a dry spot. I liked to have several syringes loaded with water (but no pill), upright, and ready in a jar. By preparing them an hour or so in advance, the tops could dry out and make them better for holding a pill. The photograph on the left isn’t the most detailed– the plunger of the syringe is pulled all the way back, the widened barrel section is filled with water up to the point where the soft rubber tip begins. But the rubber tip is not filled with water– this allows the soft tip to dry out a bit before “loading” the pill. When it came time to give Rudy his pills, I would very quietly load the pills into the dry, soft rubber tips of the syringes. I’d make sure to do it as quietly as possible– if Rudy heard me, he might scurry under the bed– after all, cats are still cats no matter how appealing we try to make the pill process! Take your time with this step so you can keep the tips dry and the syringes upright. Then, with all your pill syringes now loaded and ready, go find your cat! The process of convincing your cat to open its mouth for a pill is pretty accurately described in the Wedgewood video at the beginning of this post. The only additional suggestion I would have is that I found it really helpful to do it on a couch with your pet’s back against the seat. Sometimes, Rudy would try to avoid the pill by “backing up”– having his back against the couch seat made it harder for him to squirm away. 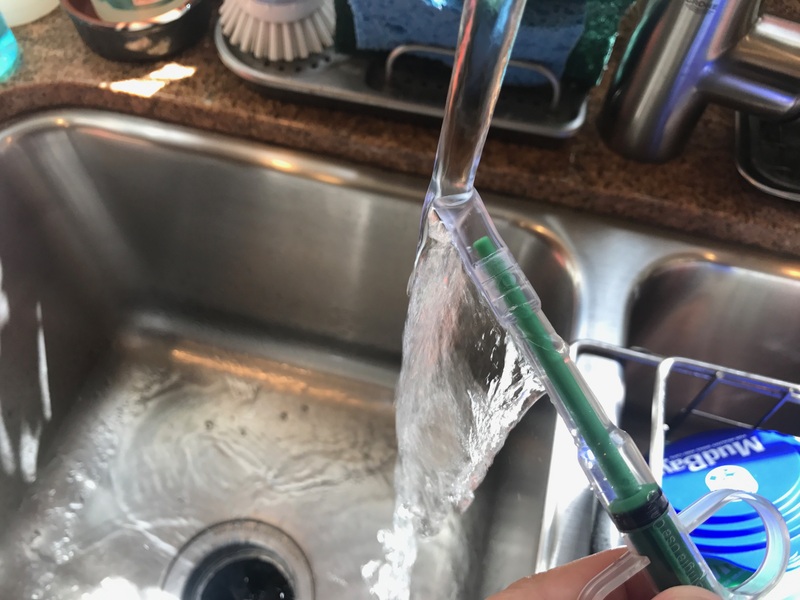 I’m right-handed and I would hold the syringe with my thumb and middle finger of my right hand in the two clear plastic “loops” of the syringe and my index finger ready to push down on the plunger. 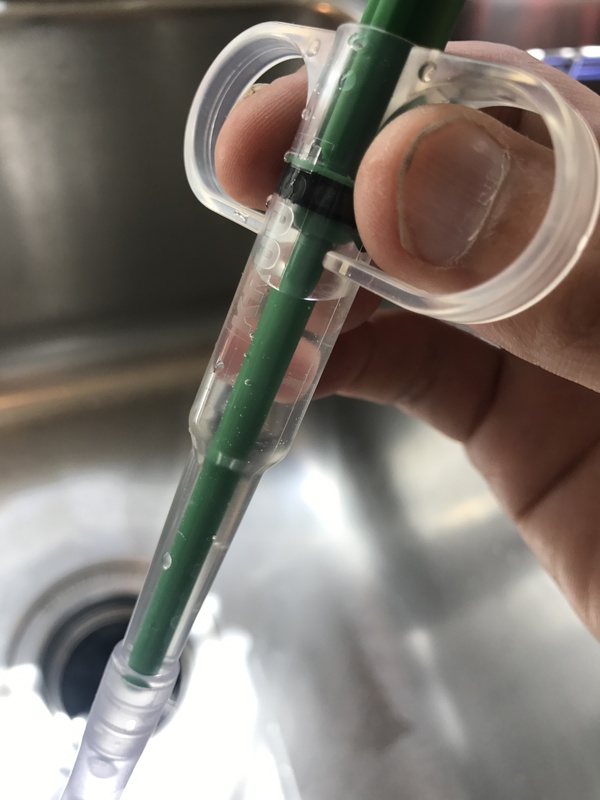 Immediately before giving Rudy his pill, I would then shake the syringe once gently to get the air bubble to the top and the water in full contact with the pill (as shown in the picture on the left). I would hold Rudy’s jaw with my left hand (as shown in the Wedgewood video) and use my right index finger to help convince his mouth to open just a crack. With cats like Rudy, once their mouths open a little bit, they open it wide for a split second. At that moment, I would insert the syringe in his mouth and push the plunger. Whoosh! In one quick motion, Rudy gets his pill and swallows it simultaneously with a splash of water. 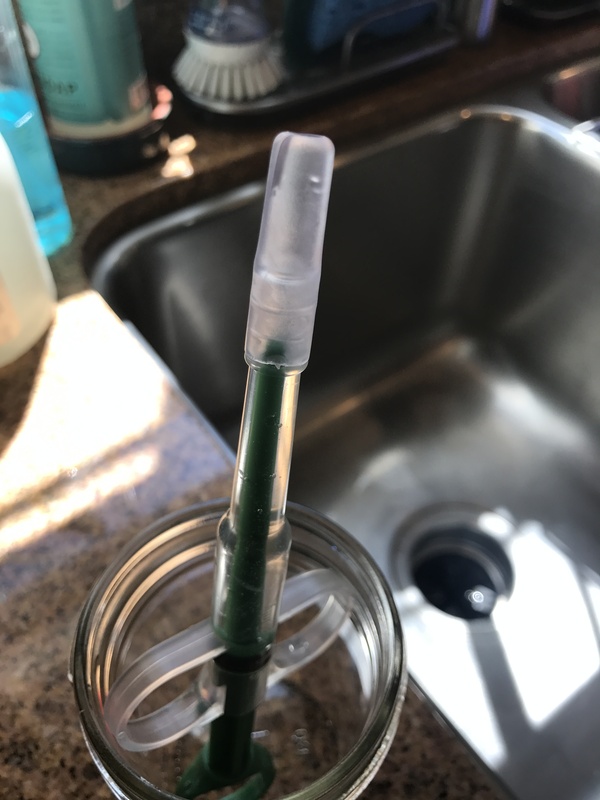 I found that this process worked brilliantly– Rudy got his medication and the only discomfort was the surprise at getting a tiny gulp of water. Rudy became so used to the process that he could take a size 0 capsule (a standard large size capsule for humans) just as easily as a tiny capsule– which made it convenient for everyone because I could combine a lot of medications in one capsule (but the tricks for doing that are for another post). I honestly believe that this was a kinder and simpler way for Rudy to get his medication. I described the process above in a lot more detail than necessary– it’s actually very simple and almost automatic once you’ve done it once or twice. When I was done, I would make sure to praise Rudy and always give him a reassuring treat. This way, I could minimize any feeling that he was being punished. And how could I tell that he didn’t think it was an awful experience? Because he never expressed anger or tried to “get me back” for giving him a pill once in the ten months he endured this treatment. Instead, he frequently hopped back on my lap a few minutes after getting his pill and acted like his normal affectionate self. Maybe he was trying to tell me what I only figured out a few days ago– that I should be telling a lot more people about this better way to give a cat a pill?